A belated happy Thanksgiving to all who celebrate! 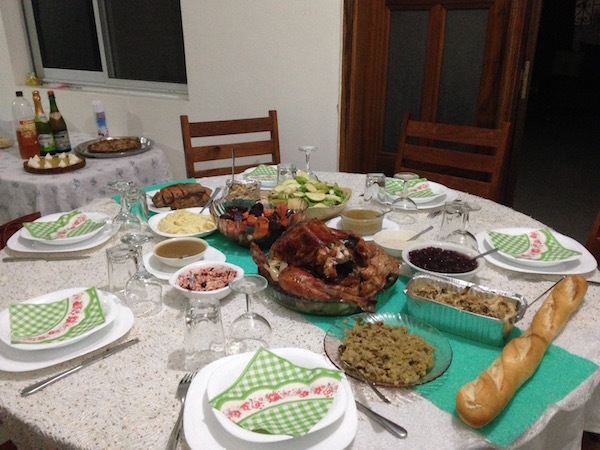 Last week was stressful, between planning against the clock for a 4-country shoot that begins on the 1st of December, and trying to pull off an American Thanksgiving in Dakar at the same time. I am affectionately calling last Thursday’s festivities the toughest producing job of my life. But, in the midst of the madness, I did take the time to count my blessings and to acknowledge all that I’m grateful for. Which is so, so, so much this year. Including the Thanksgiving meal itself. Until the moment everything was on the table, I wasn’t sure I could pull it off. We didn’t even order a turkey until the day before. The price for a 13 pound bird? Almost $60. Turkeys are rare and thus expensive here. Having never cooked one before, having found no pan big enough to hold it, and having realized too late that I had neither a grill to lift the turkey off the pan (apparently very crucial) nor sufficient time to marinade the bird (also important), the possibility of a very expensive turkey fail weighed on me as I went downtown to pick it up from the Lebanese poultry shop at 9am on Thanksgiving morning. …which is on the second floor. Under the weigh of its contents, the pan buckled and almost broke on the way up the stairs. 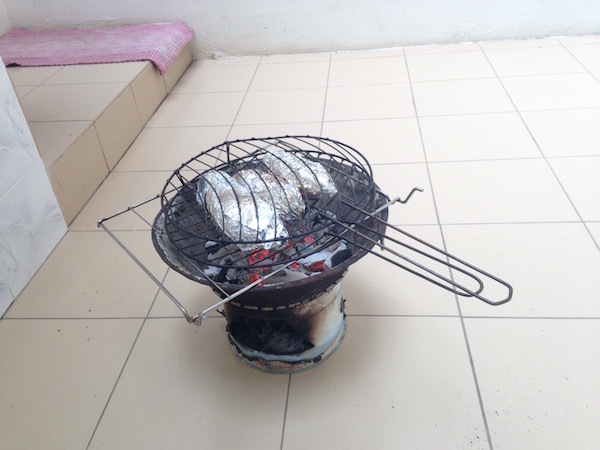 Then there was the problem of the temperature. I knew the turkey was supposed to cook at 350 degrees Fahrenheit for about 3 hours. I had converted that to Celsius, only to recall that the Lo’s oven isn’t marked with temperatures but with the meaningless numbers 1 through 8. So I had to check on that thing – with the only meat thermometer I could find, an unreliable non-digital version – every five minutes for the last three hours of cooking. When it finally came out of the oven I had absolutely no idea if it was undercooked, overcooked, cooked on top but not bottom, or what. The Lo’s have two women who come to do the cooking and cleaning on weekdays, and Madame Lo wrangled them to help me prepare the other dishes. I would have been sunk without them, though the three of us made a rather ridiculous group: they were completely unfamiliar with everything I wanted to make and the ways I wanted to make it, and I sort of was, too. I’ve been making some of these dishes for years, but in Dakar I had to come up with creative ingredient substitutions and use completely different cooking tools. It’s somewhat shocking to me that we made it work. One dish that actually turned out better the Senegalese way was the sweet potatoes, which we cooked on the grill that they usually use for fish. 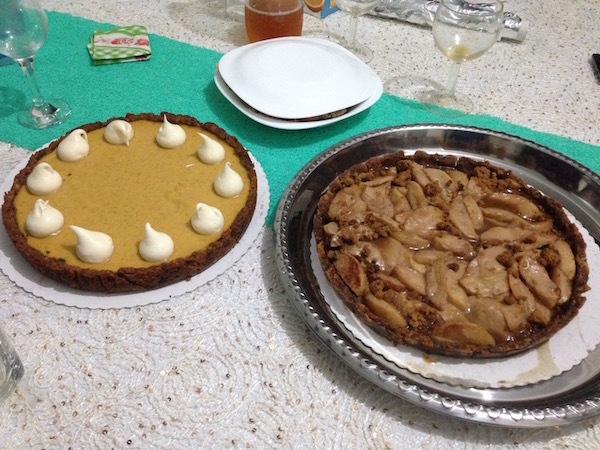 Speaking of which, the pumpkin and apple toffee gluten-free tarts that I ordered from a German baker who has a counter at the American Food Store were better than anything I could have whipped up. 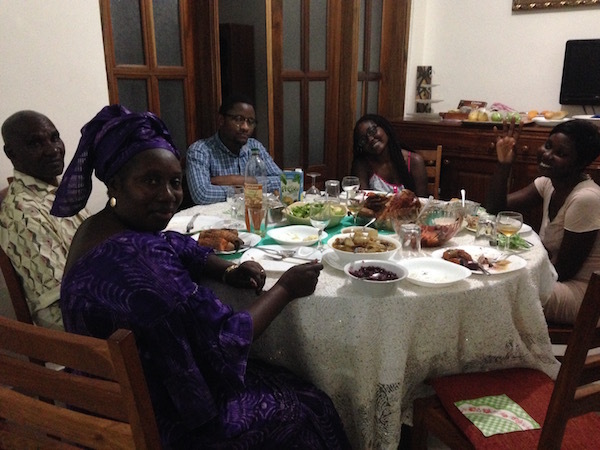 And it meant that we had an American, Senegalese, Lebanese, French, and German Thanksgiving. Exactly as it should be. I wasn’t sure how the Lo’s would feel about the meal. I’ve cooked for them a few times before and I’m never sure if they are being polite or truthful when they compliment the food (except for Mamie, who is without fail so effusive that I know she can’t be faking it). But this time they all went as nuts as Mamie usually does. They were in especial rapture over the (miraculous) perfectly cooked turkey, the pumpkin pie, and the green bean casserole, all of which they had never tasted before. Which meant that Mamie had to take it to a whole new level. She took off work early the next day to come home for the leftovers lunch. Now Madame Lo is talking about making turkey for Christmas instead of their usual mutton. And I’m thinking of surprising them with another pumpkin pie that day. It’s amazing how much joy sharing food between cultures brings.